This festival actually started back in 1999 as a small event that grew very fast for the next 4 years and was able to bring up pretty big names in the small city of Skien, in Telemark Norway, 2 hours by bus from Oslo. 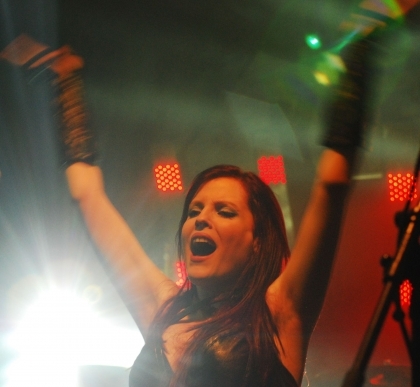 Then the festival took a break until 2009, and working its way up towards a great event with a 2010 edition full of nice surprises and headliners such as Ram-Zet and Sirenia. It was held in a location called Katakombene, part of the local cinema center and which is occupying the space of an old local brewery (Lundetangen Bryggeri). The name of the place suits it very well, it's easy to feel like inside some catacombs. Candle lights, round ceilings, iron gates, long tables, local beer, cheapest food I ever saw at a festival, all these contributed to a good atmosphere and mood among the attendants. One thing I noticed and it was a very pleasant surprise was the amount of youngsters performing with 7 or 8 strings guitars and 5 or 6 strings basses. The stage was not a big one, considering it had to fit the size of the cellar, a big complaint - from the photographer point of view - goes to the lights arrangement. The sound was way better than I've seen in places like this one and the greatest thing to praise is the niceness of the organisers and festival staff. They had a bunch of smiles to share at all times. First day of the festival, Friday, started with last year winners of the festival talents contest, Onymf. Very young band members, all around 16 and playing together for about 3 years. They guys are surely on the right track, both with their musical ideas and performance. There's certainly a lot to work on - the dramatical show of the singer was totally ruined by some hand gestures for example - but will happily check them in few years to see how they have evolved by then. An explosion on energy was brought on stage by the next performers, Wild Side, with their leather clothes and glam rock music. One of the starters of this band is ex-Pagan's Mind guitarist Thorstein Aaby, who unfortunately died few years afterwards. Alas, this fact has nothing to do with their style. They performed their only release, Speed Devil, which has the sound of one of those many 80's albums in the range of Mötley Crue maybe. The stage show though, with the singer who kept interacting with each band member or lifting the microphone stand over his head, was very entertaining for the crowd who screamed really loud 'We want more!'. A nice moment was when the drummer stepped up and asked everyone to sing happy birthday for one of the band members. They crowd got more great music though. 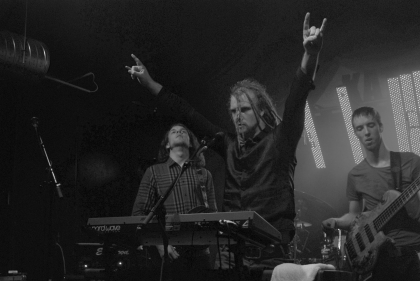 The next band on stage were the talented Nottoden group, Leprous, whom I've already seen live many times (either by themselves or as backing band for Ihsahn) and they're getting better by each performance. And after each of these performances, I only heard superlatives used together with the band's name as they easily impress the audience with the quality of their progressive music, its original composition and mixture of elements. And not to forget the accuracy of their style. Original are also their stage outfits based on combinations of red and black, ties, vests and tshirts. Their show got a bit delayed due some technical problems and I personally couldn't hear the keyboards all the time from where I stood. But other than that there were about 40 minutes of awesome tunes and musical skills. Which made the crowd scream again that they want more, and to my surprise, they reacted to some of the song intros/names from "Tall Poppy Syndrome", meaning that their music is getting more and more familiar. Good music continued to be performed by Triosphere, a band who, in 2009, received the award for Metal Album of the Year from the worlds largest independent music organization “Just Plain Folks Music Org.” in the USA, competing with over 80.000 artists in all genres around the world. The band has a female vocalist, Ida Haukland, who is also the bass player and who did an incredible job with both of her responsibilities in the band. Surprising to hear what a powerful voice comes out of that little woman. They only have two albums up to the moment, and I'm willing to check them out as the songs seemed rather complex and balanced, nicely developing from one end to another, blended with speedy guitar riffs, making the power metal they are playing quite catchy at times. The night was ended by another female fronted band, Ram-Zet, and their extreme or avant-garde metal. My personal level of tiredness was quite high during their concert, so I didn't manage to see more than 2 songs. But I didn't get impressed by what I saw, hence the choice to go for some nice chats backstage. Their music is a tad weird for my taste - I actually read or heard something like they call it "schizo" metal - and the range of vocal sounds makes it even more weird. So I won't say anything else about their concert, since it wouldn't do any justice to them based on what I paid attention to. Day 2 had again the session of 1001 Watt talents, but I missed it. So the day started with a really nice surprise, another band from Telemark region by the name of Wintergrave. They are also pretty young, have been around for some 3 years, but the music they played was mind blowing. It's a black metal taking you back to older albums of the genre, but spiced up with thrash like growls and progressive keyboards and guitar riffs. The vocalist is very talented and I mainly concentrated on listening his growls, rather than paying attention to what the others did. The band introduced their new bassist for whom this was the first show and I hope he gets over his shyness quickly so that they can make a compact show in the future. The second band I mainly came for at this festival were the progressive guys from Illusion Suite. During the first song I was a bit disappointed with the sound, but it quickly changed to a great experience. I only heard the band few weeks before the festival, but got easily hooked up by their album, "Final Hour", a 2009 release, with nice melodies supporting a very pleasant voice that goes from dark tones to soft melodic ones. Even if the main feeling is a Dream Theater inspiration, they don't lack heavy metal or power metal bits, but I really liked the continuous variation of speed in their songs, without overloading the music with so much variation. It was surprising to realise that the backing voice belonged to the drummer, and not to a recording and it was quite a touchy moment when the singer left the stage, the drummer stood up and sand a very slow part of a song. After two really great opening shows of the day, I was thinking I would have happily change the order of the bands so I could get more songs from the first two. I still had it after the performance of the Danes from Iron Fire and another reprise of power/speed metal. The show was catchy and energic though, the guitarists and bassist moving all over the stage and playing solos together and the vocalist kept talking to the crowd in between songs. Before the concert, the organisers did a very nice gesture for a fan of the band and allowed him to go backstage and talk to the guys. The fan was so enthusiast and I think the band was a bit overwhelmed by his words. The music was again, something you have heard before with Helloween or Gamma Ray, so it didn't have anything special in particular, but that was compensated by the band's good mood and scene show. A nice gesture from their side was to dedicate a song to the ex Gotthard singer, Steve Lee, who recently passed away in an accident. The song was called 'Still Alive'. The festival drew to an end with a melodic goth metal performance from Sirenia and a charismatic stage presence of its singer, Ailyn. I haven't been too much into female fronted bands lately, and I can't say they have changed my mind, but I have no regrets having had seen them live. It was a great performance, I liked how it sounded overall, I was surprised by the lack of bass as instrument on stage (it was imitated with the use of a guitar) and I liked the mix of nice female parts with really heavy growls and great intense choirs. The band had some die hard fans in the audience and they could sing the lyrics and cheered all along the concert. At the end, I would still have liked to see more of the two opening bands, but I can understand the choice of the organisers and I'm pretty sure it was a very pleasant evening for those present in the crowd. And for me, as I had a bonus of funny moments with the vocals of various bands warming up for the shows or just messing around with various strange noises in the backstage. All in all a nice 'small' festival (compared to others I attended at least) but it would be great if they could keep it going, support and promote very talented musicians like they did this year. Videos from the 2nd day (forgot about my video camera on the first one) can be found here: http://www.youtube.com/view_play_list?p=4FF47384108CA428.